After the first journalist drives of the Volkswagen ID Neo prototype, we can almost understand what Volkswagen wants to do with its compact electric car. The Volkswagen ID Neo is a Golf-sized hatchback created on top of Volkswagen’s new MEB architecture, and it will be unveiled later this year. It is a close competitor to the Nissan Leaf. Yet, as Volkswagen promoted it as a car with the size of a Golf but roominess of the Passat, I am sure it will embark on its way to steal some buyers from the likes of the Kia E Niro, the Hyundai Kona Electric, or other similarly sized electric cars and crossovers. However, the car that hides under the body of the Golf Sportsvan shown here is probably a bigger, family version of the same kin. Make no mistake; this one is also based on the same ID Neo architecture. Apparently, Volkswagen has plans to introduce as many as 50 new electric models by 2025. The ID Neo will create an electric VW avalanche and, at first, it will be priced in a similar bracket as the Golf Diesel. 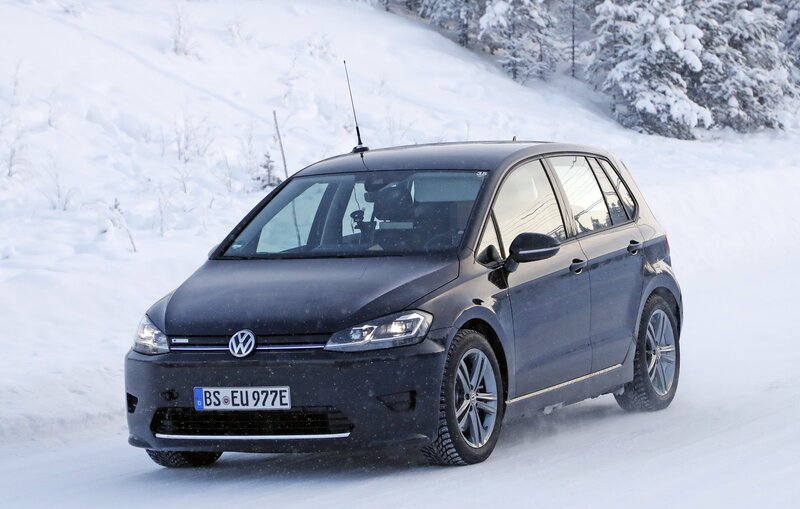 I believe that the electric Golf Sportsvan’s brother will cost a tad more.